This unique memorial sculpture honors the firefighters who have the “Courage to Serve” wherever they are called. 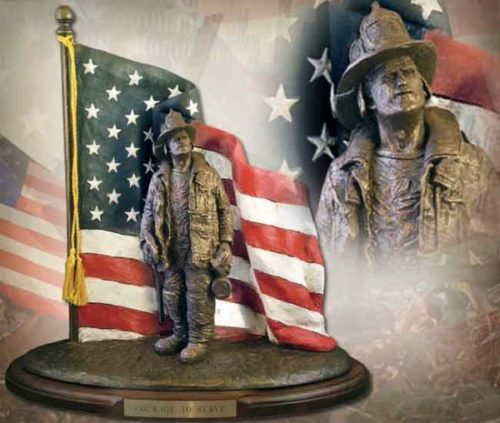 Honor the hero in your life with this sculpture by Michael Patrick Garman. Handmade to order. Sculpture measures 14.75″ x 14.5″ x 7″. ©2002/2006. Bronzetone finish. Includes wood base and “Courage to Serve” engraved plaque. 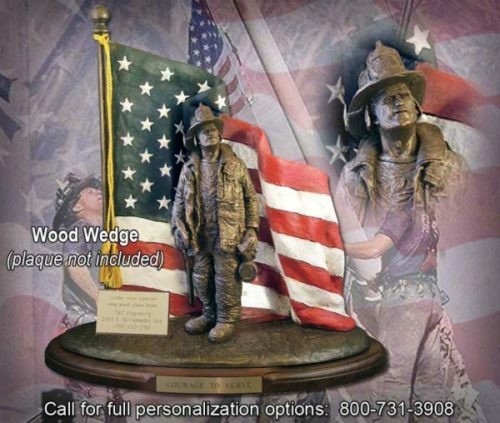 Upgrade your sculpture with an upright wood wedge – perfect for adding an engraved plaque commemorating the hero in your life (plaque not included). See ordering options below.